and loved those who are in the world (Jn 3:16). he must be noticed by God (Mt 4:18). when we are faithful in even what is least(Mt 25:40). giving us the Holy Spirit means He has taken interest in us. and serve the Kingdom of God? all of his mind and body. ○ Let us draw God’s attention. in order to be found in His sight always. ※ Not anyone can become the Lord’s servant. One must be worthy of the Kingdom of God. The one worthy of Him will become His. God is love. Some people misunderstand this and say that love is God. However God’s love is not an abstract notion as the people in the world think of it. God is invisible. Nevertheless, God demonstrated His love to mankind. His love was not manifested through any kind of philosophy but though God’s only begotten Son. God demonstrated His love when He sent His only begotten Son into the world. Jesus Christ who is God’s only begotten, displayed God’s love through His words and actions. If anyone cannot understand God’s love through Jesus, he does not have faith. God’s love is demonstrated through everything that Jesus did – His words, works, power and teachings. His death, resurrection and ascension were all fulfilled by God’s love. God revealed Jesus to mankind to demonstrate His love, not to load him with any burdens. God is not in need of anything that He has to forcibly take something from man to be satisfied (Acts 17:25). He created Heaven and everything within it, as well as this world and everything within it. The reason God created all other creations before He created man was to let man enjoy all those things. God desires to give us what is good. He gives us His word because He wants to give us eternal life (Jn 12:50). Jesus said, “I have come that they may have life, and that they may have it more abundantly” (Jn 10:10). Just as bees collect honey from a variety of different flowers, there is so much that we can receive from God. God’s will is to give us everything out of His abundance. Jesus suffered every kind of affliction when He came to the earth, like someone stuck in mire. It is a mistake to think that He received any glory on the earth. He said the glory He was to receive was in Heaven. And indeed He died, resurrected and ascended into Heaven, and was finally glorified. The coming of the Holy Spirit verifies that Jesus has been glorified in Heaven (Jn 7:38). Some people carelessly say, “I’ve also received the Holy Spirit and spoken in tongue before, but there’s really nothing to it.” However the coming of the Holy Spirit cannot be treated so carelessly. What Jesus endured on the earth is literally a curse. Everything that people would want to do to a person they hate, they did to Jesus. Accepting such pressures of man, Jesus said, “just as the Son of Man did not come to be served, but to serve, and to give His life a ransom for many” (Matt 20:28). The reason God sent His only begotten Son to suffer this way, be falsely accused and eventually die, was to give us something better. By the death of Jesus on the cross, we no longer perish; by His stripes we have been healed; by His poverty we have been made rich. Whoever knows these works of Jesus will definitely know that God is love. The important thing for believers is not how long they have been to church but whether or not they know God’s love. Some people say they believe in Jesus but cannot confidently answer when they are asked, “Have you received the love of God?” What is the point of believing in Jesus if we cannot receive God’s love? If we have received in Jesus, does it not mean that we have received God’s love? How can anyone who has not received God’s love, draw His attention? And how can anyone deliver his prayers to God if he cannot draw God’s attention? God’s love is rationally incomprehensible. That is why the unbelievers in the world do not acknowledge God’s love, and moreover treat those who have received His love as mystics. However we must not deny God’s love whatever temptations might come. God has revealed to us the love He has for His only begotten Son. And to whoever acknowledges that love, He has given grace so that they may also inherit the Kingdom of Heaven together with His Son. There is something distinct about those who receive God’s love. Jesus said, “He who has My commandments and keeps them, it is he who loves Me. And he who loves Me will be loved by My Father, and I will love him and manifest Myself to him” (Jn 14:21). The one who has received God’s love manifest His love. And through the Holy Spirit the Lord manifests Himself to such a person. Then, what is love? Once when Jesus was talking to the multitudes, a person came and said to Him, “Your mother and brothers are standing outside, seeking to speak with You.” Then Jesus answered, “Who is My mother and who are My brothers? Here are My mother and My brothers! For whoever does the will of My Father in heaven is My brother and sister and mother” (Matt 12:46-50). Whoever does the will of God the Father is Jesus’ mother, and whoever becomes Jesus’ mother is the one that does the will of God the Father. The mother of Jesus suffered ineffable shame and humiliation after conceiving Jesus. Until the angel appeared in a dream and told him, even Joseph who was pledged to be married to her was planning to end their relationship. So how would have others treated her when they did not know any of the circumstances? Just as it says in Genesis 3:16, “I will greatly multiply your sorrow and your conception; in pain you shall bring forth children,” sorrow and pain never ceased for the mother of Jesus from the moment He was conceived, through His development and finally to His crucifixion. When child was teased growing up, she would have had to comfort Him with a painful heart. However the teasing did not stop, and when He began His public ministry His relatives even treated Him like He was out of His mind. How upset and hurt would have been the mother as she looked on all these things? Despite all of this, she never left Jesus. She remained by His side even when He died on the cross. Before He passed away, Jesus said to His mother, “Woman, behold your son!” (Jn 19:26). During the thirty-three years that God’s Son was on the earth, the only one that stood by Him to the end in true love and consolation was His mother. Jesus said that when the Son of Man later comes to separate the goats from the sheep, He will rebuke and say to those who are like goats, “Depart from Me, you cursed, into the everlasting fire prepared for the devil and his angels: for I was hungry and you gave Me no food; I was thirsty and you gave Me no drink; I was a stranger and you did not take Me in, naked and you did not clothe Me, sick and in prison and you did not visit Me.” What is the condition that distinguishes the sheep from the goats? It is maternal love. Many people say they love the Lord and yet fall into temptation. They disobey the Lord’s word. They struggle to give tithe and offering. They complain that sermons are too long. Jesus would be quite despised if He was to come among the saints of this generation. We need to take after the example of Jesus’ mother. She loved Jesus without change, from His conception until He went up into Heaven. That is maternal love. Love that is spoken of in this world is nothing more than empathy, affection and emotion. People who have empathy are sympathetic toward others, however empathy is a short-lived interest; it is not love that takes responsibility to the end. Affection can be very passionate at times. It is no strange sight to see couples hugging in the streets these days while newlyweds boldly kiss each other before their many guests. But before long, they become enemies of each other fighting over the division of property. Emotions also do not last. Every year countless relief organizations are formed and many people pledge their support, however the majority of them wind up after a few years. That is because many people make promises on a sudden impulse of emotion but never keep them. It is not difficult for a person to say that he loves God. However what comes from people’s empathy, affection and emotion will certainly not last very long. Taking responsibility to the end for the child that she conceived and birthed through her own body is maternal love. The love that Jesus’ mother showed the Son of God was maternal love. While the people cursed, scorned, condemned and killed Jesus, His mother stood by Him to the very end. This is the love that Jesus desires from us. The Lord considers those who have this love as His mother, brother and sister. It says in 1 Corinthians 13:1-3, “Though I speak with the tongues of men and of angels, but have not love, I have become sounding brass or a clanging cymbal. And though I have the gift of prophecy, and understand all mysteries and all knowledge, and though I have all faith, so that I could remove mountains, but have not love, I am nothing. And though I bestow all my goods to feed the poor, and though I give my body to be burned, but have not love, it profits me nothing.” The love described in these verses does not refer to that of people who say “I love You Lord” one day, and fall into temptation the next day. It refers to maternal love that bears and takes responsibility for the loved one to the end. We are the ones who have conceived God’s word and Jesus’ name. Therefore we must bear His word and Jesus’ name to the end regardless of any persecution. Even if we have to die, we must guard the word of God and Jesus’ name within us. Whoever does not love God cannot love his neighbors. Such a person would not be able to bear any fruits. When a branch withers and produces fruit no longer, the farmer cuts down that branch and throws it in the fire. God will treat those who do not have maternal love as wicked and lazy (Matt 25:26). Even if a person has graduated from a seminary and become a pastor, without maternal love, God cannot use him. The Pharisees were very upright morally. They were circumcised after eight days of birth, taught and raised by the Law from then on. Even so, not one of the disciples of Jesus was a Pharisee. Instead many of His disciples were fishermen. The Lord had called to Him those He wanted (Mark 3:13). Are you someone that the Lord wants? Do you draw His attention? Whoever loves the Lord can draw His attention. The Lord loves such people and reveals Himself to them. Some people think that the reason they are not blessed is because they do not pray enough. However the Lord said, “For they think that they will be heard for their many words. Therefore do not be like them. For your Father knows the things you have need of before you ask Him.” Then He told them to pray, “Our Father in heaven, hallowed be Your name. Your kingdom come. Your will be done on earth as it is in heaven.” This means we must honor God, fear Him and love Him before we ask for anything in prayer (Matt 6:7-10). Then there are some who grumble against God saying, “I pray so much but why is there no answer? I zealously go and serve the church, but why am I not blessed?” Such people are capable of rebelling against God one day. And how will they receive any help from God? Our desire is for the Lord to manifest Himself to us, to our families and in our workplaces. For this, we must first do the will of God. We must have maternal love – maternal love towards God, the church and the souls. Trees that fit this phrase are easily spotted in famous lofty mountains. I had once seen an old tree when I visited Mt. Halla in Jeju Island as well, but I was really surprised at its appearance. This type of numerous trees were displaying their white trunks amongst splendid forest, standing tall, enduring through the rain, wind, and blizzard in the winter. These trees looked like paintings of a calligraphy brush that enhance the beauty of watercolors. Though the branches were leaf-less and bony, the classical grace and dignity that it presented were surely beautiful. I first saw such picturesque scenery when I flew on an airplane for the first time in 1965. I do not remember the name of the tree now, but I used to call it a locust tree. I was a young man in my 20s, full of ambition and faith like a magnificent forest. However, I thought that one day, all the leaves would wither away and rot. One day, I heard about the locust trees from news that they live a thousand years and another thousand years even after death. Then, I clearly set up new hope, courage, and direction for my life. I shall not live like a splendid forest of Mt. Halla, but like that locust tree that lives a thousand years like and possess the strength to even live another thousand years after death. In order to do so, God must give me such strength. I was full of expectations and hope. While I live in this world, I shall enwrap myself with green leaves. Even after I leave the world, I must stand tall like a locust tree that props up the picturesque beauty of a well-known mountain. How can I obtain the preserving strength that enables me to endure like a locust tree? Without God’s help, it is definitely impossible; thus, I began to be determined and prayed to be so enduring. Like various types of trees in large mountains, there are so many different types of people living in the world. Nonetheless, do any of them manifest the power of a thousand years? Even if they do, do they display the same quality of life after their death? Among all Korean presidents, former president Syngman Rhee and Chung-hee Park have set up national foundations that will remain influential for a thousand years. They are being criticized by some people who disagree with them; yet, these criticisms are just few flaws in a jewel. They have laid a foundation and achieved a historical value that we as the citizens should never forget. 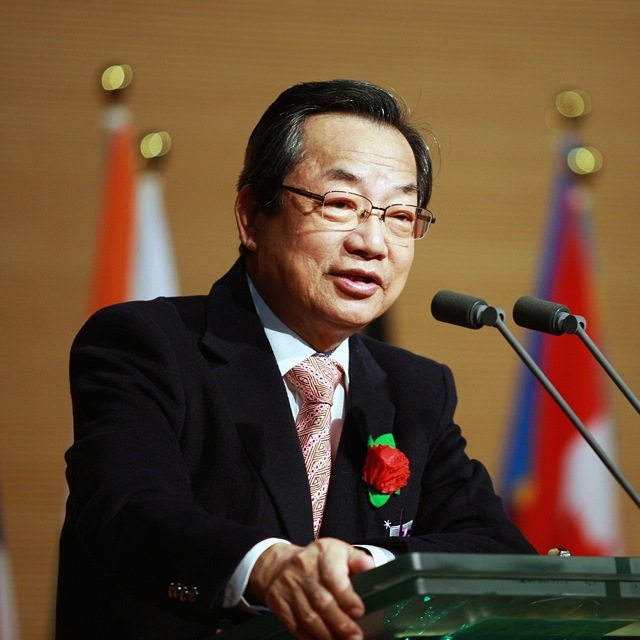 The former president Syngman Rhee had built a framework of democracy of freedom whereas the former president Chung-hee Park has set up a skeleton of modernization that could overcome chronic poverty that began from ancient times. I, too, shall become a green tree that prospers a thousand years and endures as a pillar of a splendid forest for another thousand years even after death with my message. In order to fulfill this dream, I envision the construction of eternal holy lands like glorious foundation that will persist with the Lord Jesus’ name. Even if I no longer exist in the world, the Berea Movement that I had started will endure with the strength of a locust tree. in order to fulfill His great will. and to glorify the Son so that He could inherit Heaven. In Heaven, the fullness the Father’s glory and eternal life exist. man may be glorified together with the Son (Ro 8:16-17). and also with the Nazarene who was born through her. for it is our faith (Jn 3:16). who obey Him and abide in righteousness. the Holy Spirit into our hearts. and bless their souls with eternal faith. always stays near and nurtures them. he will experience the Immanuel. with all of our heart and strength. There is a verse in the Bible that is most touching and joyful to mankind, which is Matthew 1:21, “And she will bring forth a Son, and you shall call His name Jesus, for He will save His people from their sins”. Just because this word has been fulfilled already, some people regard it as merely a past event or they are not really moved by it. However for us, it is unimaginable what it would be like if it wasn’t fulfilled. This word has already been realized and everything has changed for us as a result. This word did not come about suddenly before Jesus came. Prophecies concerning Him were echoing long before He came. For example, God said to Abraham who walked with Him, “I will certainly return to you according to the time of life, and behold, Sarah your wife shall have a son” (Gen 18:10). In the English ASV, this is written as, “I will certainly return unto thee when the season cometh round”, and in the RSV, “I will surely return to you in the spring”. Through Abraham, God had spoken in advance of a spring time. Although spring is not visible in itself, we know that spring has come when we see the flowers bloom. There was the word of prophecy saying, “If the impossible happens so that you have a son, you will know that I have returned to your household,” which was actually fulfilled. The fact that a son was born to Abraham at the age of a hundred through Sarah carries two meanings. From Abraham’s perspective, it means spring has come to his household. And from God’s perspective, it means His will has been fulfilled on earth according to His dispensation. In other words for Abraham’s family, it was the fulfillment of a small part of God’s promise given to him, whereas for mankind, the advent of spring was foretold. For the Son of God to come to the earth according to the prophecies, much interference was encountered. There were such great difficulties that even the survival of Israel as a nation was uncertain. There were critical moments that cast doubt on whether God’s plan could actually be fulfilled. Nevertheless, the promise of God was eventually fulfilled on earth through the passage that started from Abraham and continued down to Joseph. People often say that Christmas is the day the Son of God was born. But strictly speaking, that is incorrect. Jesus referred to Himself as “Son of Man”, which denotes God who came as man. The one who was born is the Son of Man, not the Son of God. Jesus Christ is God’s Son and the Son of Man. He was born as the Son of Man; however He was not born as the Son of God but had simply come. When the Jews asked Jesus, “You are not yet fifty years old, and have you seen Abraham?” Jesus said to them, “Truly, truly, I say to you, before Abraham was, I am” (Jn 8:57-58). Again, when the disciples said, “This is a hard saying; who can listen to it?” Jesus said, “What if you were to see the Son of man ascending where he was before?” (Jn 6:60-62). Jesus was together with God from eternity past. He became the Son of Man when He was born into the earth at Bethlehem. Spring had arrived for Abraham when he had Isaac in his old age, and consequently kings came forth out of his descendants. God set such faith of Abraham as a model and the descendants of his faith finally came to meet the King of kings. The Son of God came as Christ with the name Jesus. He became flesh in order to pay the price of sin which the sinners were supposed to bear. He is originally the Word that was in God’s bosom, meaning He is spirit. The reason He came in the flesh was to die. By His death on the cross, He received the eternal punishment that mankind had to receive, and gave them eternal life by shedding His blood. We have thus been saved because the Word that was with God came in the flesh, tore His flesh and gave it to us. It is still too early to rest easy even though we have been saved. Our hope is that the Lord will return and take us to Heaven. Before then what we must undergo is the resurrection. As the flesh came from dust, it returns to it upon death. It is not the flesh that will be brought back to life when the Lord returns. Upon His return, the souls resting in Paradise will all of a sudden be transformed in a flash into an imperishable body and meet the Lord. Those who are on the earth will meet the Lord after their perishable body is changed into a spiritual body in a flash. Of course for that to happen, the Lord has to take them up to the air. Even if one is saved, he cannot be transformed and go up to the air on his own. It is impossible unless the Lord calls him. Nobody knows when the Lord might return. Therefore we must never be apart from the Lord even for a second. Immanuel! Immanuel is what we need. Immanuel was never realized prior to the coming of Jesus, the salvation. Although the Old Testament believers walked with God, God did not have an obligation to do so. Strictly speaking, though people can be said to have walked with God at that time, they cannot be said to have been together with God. Plus it was only a very small number of people that had the chance to walk with God. Of them were Enoch, Noah and Abraham. Though they had great faith, their relationship with God was only as those who “walked with” Him. At that time, even if man followed God, they could not keep hold of Him. No matter how much they yearned for God, they could always slip away from God. Before Jesus came, nobody was saved regardless of how great their faith was. Some people had to wait thousands of years until their faith was realized. For them, it was a luxury to even dream of a hopeful future. If Jesus had not died on the cross, the people of the past would have had nothing to do with salvation. They kept their faith to the end in the hope that faith’s reality will one day be revealed. A person like Abraham even sacrificed a son born to him at the age of a hundred in order not to lose his faith. The moment Jesus Christ shed His blood on the cross ad died, salvation finally arrived also for those people of the past. They had succeeded after struggling all those years. Strictly speaking, the salvation of the Old Testament people is not as perfect as that of the New Testament people. Salvation for the people in the New Testament times is made perfect because the Lord is with them. There was faith during the Old Testament times but no salvation. However, there is both faith and salvation in the New Testament times. Faith is connected to the idea of ‘walking with God’, while salvation is related to the idea of ‘God being with us’. Through faith we may walk with God. However, salvation is perfected by God being with us. We cannot be with God at our own will. All we can do is follow after God. He must abide in us for our salvation to be made complete. This is very important. Why is that? The Spirit of Him who raised Jesus from the dead must dwell in us so that He who raised Christ from the dead will also give life to our mortal bodies through His Spirit who dwells in us (Rom 8:11). Immanuel means God is with us. John 1:1 says, “In the beginning was the Word, and the Word was with God, and the Word was God.” Here, the word with is in Greek, πρός (pros). This is not in the same meaning as when somebody calls their family overseas and says, “I’m always with you in heart.” When we consider the relationship between God and the Word, this word πρός (pros) cannot be used so lightly. And if we consider how this word is used to describe our relationship with God, we can imagine just how special our relationship is. If a person is carrying two buckets of water in each hand, the water contained in each bucket are going parallel to each other. But if one of them is poured into the other bucket, they become one and inseparable. They can never go back to their original state. With the coming of Jesus Christ, the age of Immanuel has begun. The appointed time has come and springtime has thus begun. Jesus Christ died, resurrected and ascended into Heaven, asked the Father and has sent the Holy Spirit to us. By this, our salvation has been fulfilled. The salvation we received is so perfect that the people of the Old Testament envy us. Immanuel that was promised through the Prophets has finally been fulfilled in us. Jesus was born in a shabby and smelly horse stable in Bethlehem. While there were some trying to kill Him from birth, the Magi from the East travelled a long distance to worship Him who was born as King, and presented gifts of gold, frankincense and myrrh. These three gifts each bear a significant meaning. Thus the Magi laid before the Lord the three most valued things in the world – man’s life, culture and splendor, and confessed, “We welcome You coming into this world!” This is the attitude that the church too must take on. The Lord came to the earth to be with us. Though He greatly suffered on the earth, He did not take revenge on those that afflicted Him but instead in the most agonizing moment He prayed, “Father, forgive them, for they do not know what they do” (Luke 23:34). The Lord endured to the very end in order that He may dwell in each one of us. However He gave us a stern warning. “Anyone who speaks a word against the Son of Man, it will be forgiven him; but whoever speaks against the Holy Spirit, it will not be forgiven him, either in this age or in the age to come” (Matt 12:32). There is still forgiveness for anyone that disobeys the Lord who came as the Son of Man. However there is no forgiveness if anyone disobeys the Lord who has come within us. It is possible for man to walk with God by faith. But the Lord must come within us and be with us in order for our salvation to be complete. Just as the Lord said in Matthew 8:20, “Foxes have holes and birds of the air have nests, but the Son of Man has nowhere to lay His head,” there is no place for the Lord to dwell in this world. Let us not try to trace back past memories by going to the horse stable in Bethlehem or the grave in Jerusalem, but surely realize that the Lord is within us. We should not be satisfied at just walking with God but make sure that Immanuel is fully realized in us as prophesied in the Scriptures. As we celebrate Christmas, our faith should not just be about rejoicing the birth of baby Jesus. He came into the world as King. Psalm 24:9 already hinted at the power of God’s kingdom where it says, “Lift up your heads, O you gates! Lift up, you everlasting doors! And the King of glory shall come in.” Now we must receive in the Lord that He may become King within us. We were people utterly destitute in the beginning, but not anymore. Jesus has filled our deficiencies and become our glory. Now we need to forsake our old wicked habits and endeavor to live a life worthy of His grace. We must not slight this privilege of Immanuel given us by losing our hearts to the three great treasures of this world represented by gold, frankincense and myrrh. Our hearts should be filled with the hope of Heaven, and we must daily experience the testimonies of Immanuel while we are on the earth. Though life in this world is hard, we have to triumph over the world and be filled with the power of life to overcome sicknesses and our weaknesses. The evidence of Immanuel must greatly be displayed in our lives. Serving the church is a rightful duty of anyone who acknowledges that Immanuel has been fulfilled. Every member of the church needs to make a united effort in giving offering and keep the church moving. And every saint should willingly serve the church. Everyone should make an effort, even if that is picking up a few pieces of rubbish in the church, instead of trying to avoid it by saying they are busy with their own work. And people should share the load of work with others so that they too may take part in serving the church. Even when opinions may clash between the saints, nobody should get upset. Rather, the strength of the church needs to be built up by everyone sacrificing himself. The church must be filled with the evidence of Immanuel. Since my body has grown weak, I often reminisce the memories of the past. When I close my eyes, the brilliant light of Paradise brightens the darkness. Thus, I bow before the Lord and seek Him all the more. I was born in the flesh, lived like a beast, and dreamt worthless dreams like worms. Yet, everything that happened in my life was like a vapor in the air. God had molded this worthless clay in the Lord’s image. And I am grateful for I have lived about a hundred years by His amazing grace. What I currently desire to focus on is how I should live the remaining days of my life. I have no greed or hope for a better life in the world. Rather, I only possess this brilliant light of Paradise in my body. Hence, before I reach the Paradise, I have to pour out all my inspiration and wisdom that remain in my body in order to birth at least one more disciple. I am grateful for those who kindled a flame in me by persecuting me. If I didn’t experience that kind of persecution, then I would’ve been lazy and arrogant. And I would have spent my life in complacency; however, since the persecution was so harsh, I began to consider such persecution as a blessing and only concentrated on God’s work with all of my strength and heart. With my soul and might, I tried to prevent the truth being distorted while receiving the persecution. The writings that I’ve written simply represent me. They were about the benefits of my spirit and concerning the life of my flesh. Thus, they will testify for me, and the Lord in Heaven will acknowledge my efforts. The Lord already knew that I am a sinner and thus, He shed His blood for me and led me in His path even today because my dream about learning was different from others. I lack much in education; however, I am confident in knowing the truth and the Gospel of grace. Hence, I can vouch for the Gospel with my soul. Just as potable water came out of a rock in the wilderness for the Israelites, the Lord used me to bring out the water that can only come out of Jesus, the solid Rock. The saints and I have drunk from that living water. I now must work for the Lord. If there is anything good left in my body, then I must pour it out for the churches that would remain in this world. I must pour out the sound of the Lord’s blood and even my last words of encouragement to the saints. I’m not sure if it would be today or tomorrow that I will pass away, but I desire to truly love all the beloved people to the end and entrust them with the preaching the Gospel. and all things by His Word (Ge 1:1). whom He has appointed as the heir (He 1:3). but God’s Word verified as living and active (He 4:12‐13). and was manifested to the world (Jn 1:14). That Word is Logos (Re 19:13). Therefore, God’s Word is the root of our faith (Jn 1:1). when He was in the world as the Son of Man. in order to fulfill the Scriptures (Lk 22:37). and showing its authority (Mt 4:4‐10). Jesus is the Word become flesh. This Word was before the Law (Jn 1:17). becomes the authority of our faith. and fall into corruption (Jn 6:63). The Holy Spirit teaches the written Word (Jn 14:26). ○ Jesus’ faith always followed the written Word. Therefore, those who follow their emotions are just mystics. ○ We must become witnesses of faith by the Holy Spirit. He only testifies of the written Word (Jn 16:13). We must become witnesses of faith by the Holy Spirit. ○ Our hope rests on the Scriptures being fulfilled (Jn 17:12). and the Holy Spirit testifies of it. but follow only the Holy Spirit. Let the written Scriptures become your faith. God is alive. We need to examine ourselves whether or not we have faith. How many people are there who find out they are terminally ill only too late because didn’t get regular check-ups? That could happen to a person’s spirit if he does not examine his own faith. To say that God is alive is nothing like critiquing a piece of artwork as being “alive”. It is easy for people’s faith in God to be conceptual because God is not visible. However faith is very objective, historical and factual. There are some animals that bear some physical resemblances to humans. And many people thus believe humans have evolved from apes. However the Bible testifies that man was created according to God’s image, in His likeness (Gen 1:26). Jesus Christ is God’s image (2 Cor 4:4). He did not come in the likeness of man, but rather man was created in His likeness. Through Jesus Christ who came to the world 2000 years ago, we have confirmed the fact that man was created according to the image of God and in His likeness. Jesus Christ born through Mary’s body was in no way different to us in form. God has given man intellect. Therefore man is able to write and convey knowledge through it, and also read that and comprehend its message. Before sending Jesus Christ to the world, God manifest Himself to man through written records. People’s words can be written and documented. However what is written in the scripture is not just words, but the Word. That Word is “clothed with a robe dipped in blood” (Rev 19:13). Just as man has blood, God too possesses blood. For a spirit to have blood is something unheard of. Nevertheless God is the only spirit who possesses blood. The One who came to the world and revealed this truth is Jesus Christ, the image of God. Man was destined to perish as a result of his sin, but he was saved because God showed His blood to the world and gave it to man to rely on its power. People tend to trust their common sense and knowledge and deny this truth. But it is because of common sense and knowledge that people reject faith and ultimately end up in hell. When Simon confessed to Jesus, “Lord, You are the Christ, the Son of the living God,” Jesus said, “On this rock I will build My church.” Then He gave him the name Peter meaning ‘rock’. Our faith is not a groundless conception but a true reality that is built firmly on the rock. The Holy Spirit testifies of this truth. If anyone does not bury his old self through baptism and is not born again through the Holy Spirit, he cannot see the Kingdom of God (John 3:5). A faith life without the support of the Holy Spirit is very unstable. Nowadays, many people go to church for a while but later forsake their faith making excuses that they are busy with work or that they haven’t benefited much from believing. This is because they are not born again of the Holy Spirit. True faith is not affected no matter how hard-pressed it is by the world. And the help of the Holy Spirit makes such faith possible. God sends ministering angels to those who are born again. The Bible refers to them as power (Acts 1:8). Angels are the ones sent to help those who will inherit salvation (Heb 1:14). When Jesus’ disciples received the Holy Spirit in Mark’s upper room, there was a sound as of a rushing mighty wind, and what appeared to be divided tongues as of fire sat upon each of them. The Holy Spirit Himself can neither be seen nor heard. What they had seen and heard at that time was the manifestation of the angels at work as the Holy Spirit came. When the wind blows, tree branches are shaken but not the rock. In the same way, there are some who sense the activity of angels while some cannot. Nevertheless the angels are still at work. When Peter was imprisoned, he walked out the prison gates by the help of an angel. Lot and his family came out of Sodom and Gomorrah, following the angel that led them by their hand. When the Samaritans were besieged by the Aramean soldiers, the sound of the lepers’ footsteps was heard as that of reinforcement troops to the Arameans because of the working of the angels. We must not only acknowledge that we have ministering angels, but earnestly pray for more angels to be sent. Praying for more angels to be sent is the same as asking for more power. Even when the disciples of Jesus were being persecuted for the sake of the Gospel, they prayed to have the boldness to speak the Lord’s word and power to stretch out their hands to heal the sick (Acts 4:28-31). We also need power. We must have power in serving the church and to become the witnesses of Jesus (Acts 1:8). Many people today say that people do not accept their evangelism. Yet before they say such things, they must first ask for power. Our faith is not a conception but an undeniable reality. After Jesus received the Holy Spirit and went into the wilderness to be tempted, the Devil appeared before Him. When the Devil tempted Him saying, “If You are the Son of God, command that these stones become bread,” Jesus answered, “It is written, ‘Man shall not live by bread alone, but by every word that proceeds from the mouth of God.’” Although He could have confronted the Devil as the Son of God, He did not, and instead relied on the written word. The Devil set Him on the pinnacle of the temple and said, “If You are the Son of God, throw Yourself down. For it is written: ‘He shall give His angels charge over you,’ and, ‘in their hands they shall bear you up, lest you dash your foot against a stone.’” Even then, Jesus said, “It is written again, ‘You shall not tempt the Lord your God.’” The Devil took Him up on an exceedingly high mountain, and showed Him all the kingdoms of the world and their glory and said, “All these things I will give You if You will fall down and worship me.” And again Jesus said, “For it is written, ‘You shall worship the Lord your God, and Him only you shall serve’” (Matt 4:1-11). Jesus defeated the temptation of the Devil by relying on the word that was written. Here the written word is referring to the Old Testament. Even when Jesus said, “You search the Scriptures, for in them you think you have eternal life; and these are they which testify of Me,” He was speaking of the Old Testament. When the people in Berea heard Paul’s preaching and searched the Scriptures to find out if they were true, it was the Old Testament they read (Acts 17:11-12). The New Testament was not yet available at that time. There are some who mistakenly think that the Old Testament has been abolished. However it is the Law that was abolished not the Old Testament itself. The Old Testament can be considered as the foundation of faith. For example, when a postman is delivering a postcard to someone, he also has many other mails to deliver in his bag. In the same way, although the Old Testament contains many different stories, what God wants to give through them is the prophecy concerning Jesus Christ. According to a certain scholar, there are approximately 32,500 prophecies about Jesus Christ in the Old Testament. There are prophecies concerning Jesus in various parts of the Old Testament such as, how the Saviour will come into the world through Abraham’s household, be born from the tribe of Judah, come as King through the line of David, be born from the body of a virgin, be betrayed by His disciple for thirty silver coins. The reason Jesus even said, “I thirst!” before He breathed His last on the cross was to fulfil the prophecy written in the Old Testament (John 19:28). The Bereans heard about Jesus through Paul and read the Scriptures to find out whether the life of Jesus coincided with the many prophecies of the Old Testament. In result, they came to have faith after discovering that the Saviour prophesied about in the Old Testament was really Jesus. The written words of the Old Testament and Jesus’ life coincide perfectly. Hence if one has believed in Jesus, it means he came to know the Old Testament. The New Testament was written after Jesus ascended into Heaven. It testifies that Jesus Christ is the One who has fulfilled the prophecies written in the Old Testament. So even if a person has never seen Jesus, it would be no different to having seen Him if he has read the New Testament. In other words, the prophecies of the Old Testament, the life of Jesus, and the testimony of the New Testament coincide precisely. To say this differently, the working of God the Father written in the Old Testament, the works of the Son represented by the life of Jesus, and the working of the Holy Spirit that followed after Jesus’ ascension are all in agreement. Though Jesus is the Son of God, He did not confront the Devil with His authority but rely on the word that is written. The three things by which the Devil tempted Jesus are at the centre of all the countless temptations man is facing. And in order to overcome this, there are some things we must do. Firstly, we need to go beyond the issues of making a living. The reason people do not properly observe the Lord’s Day or tithe is ultimately because they are concerned about how to maintain a livelihood. The Devil says to first deal with that matter before having faith. This is even becoming a great challenge for ministers. It is terrible that some consider their ministry as a means of livelihood. A person in a ministry needs to be filled with the joy of living as a witness of Jesus. He must be determined to first live by the Word rather than desire to make bread out of stones (John 6:63). Secondly, we must not fall into temptation. When the Israelites returned from 70 years of captivity in Babylon, they pondered over why they were suffering and unable to display God’s glory as God’s people. Upon studying the Law, they discovered three reasons. They realized that they had not observed the holy day which God had commanded their forefathers. They also found that they had been robbing God of tithes for a long time. And finally they realized that they had been ignoring the name of God. The Israelites deeply repented of these things and began rebuilding the temple of Jerusalem. Thirdly, we must only worship God and give Him all the glory. The motivation for ministers to lead their ministry should not be mixed with the desire to boast of their own abilities. There are too many cases where churches take out loans to build worship sanctuaries, but end up putting it up for auction because they cannot handle it. Not everything is achieved by just saying, “I believe! I have faith!” and pushing ahead with a plan. Whatever it is, the first and foremost aim has to be to worship God and give Him glory. Christians must struggle to match their lives with the words written in the Bible. In other words, believers have to take after the Bible. To do so, we must honour the words written in the Bible. The prophecies of the Old Testament, the life of Jesus and the testimonies of the New Testament are in perfect accord. If we have been united with Jesus Christ, now we must match our lives to the testimonies in the Bible. My beloved Sungrak members, a year has already passed. The year of 2014 is over in two Lord’s Days; thus, we must rise up so that our church can take a new leap forward. 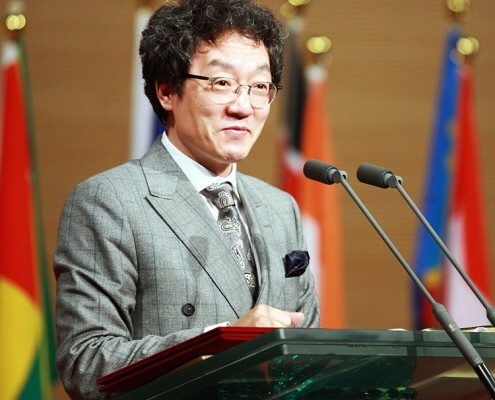 We all must put our effort and strength into leading a holy ministry with the overseer Sung Hyun Kim being the center of us. 1) Our church had the very first worship service with seven members. By the end of 1983, we had four worship services on the Lord’s Day at different times. 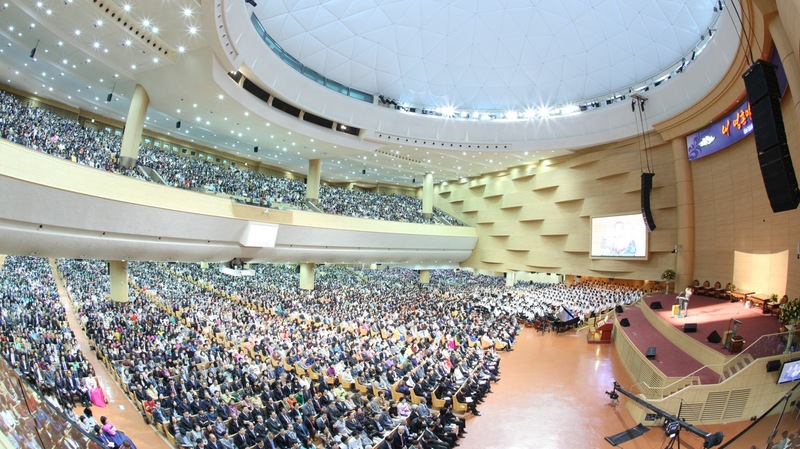 Moreover, the size of the old sanctuary was approximately 252m2, and its maximum occupancy was about 500 persons. Since we had four Lord’s Day worship services that were packed with people, we had about 2,000 congregation members. At that time, Man-Young Han had taken about dozens of people with him when he left our church. Yet, by 1988, the number of congregation members had multiplied, resulting in nine Lord’s Day worship services. If we multiply 500 (worship service attendees) by nine (a number of worship services on the Lord’s Day), then it would be 4,500. This means we had about 4,500 Sungrak members at that time. 2) Singil church sanctuary was built next. Until 1993, we had six Lord’s Day worship services; however, by building regional worship centers, we reduced the number to four Lord’s Day worship services. The maximum occupancy of the Singil sanctuary is 4,000 persons. Since we had full four Lord’s Day worship services, that would make the total number of our church members approximately 16,000. Since many regional worship centers were constructed from 1997, it enabled the church members to be scattered throughout the country and worship. Hence, we all expected revivals to occur in different regions of South Korea. 3) Since the Christian World Mission Center (CWMC) was built in 2009, we worried that the sanctuary in the center would look too empty. Thus, we recommended the regional worship center members to gather to the center, and this movement has been continuing until now. The CWMC’s legal number of seats is 12,000; yet, in reality, we can fit about 15,000 persons. If only half part of the CWMC sanctuary is filled, then the number of church members worshipping would be about 7,000. This is not an exaggeration but a fact. Because of this transition, one-third of the regional worship center members began to attend the CWMC for worship and thus, the number of attendees at the regional worship centers reduced. However, after few months of this transition, some decided to only attend the regional worship centers whereas some other members continued to attend the CWMC. Even then, the empty seats that were once occupied by regional worship center members are being filled with newcomers; thus, the number of attendees seems to remain the same, but in reality, the number is increasing. Consequently, the number of attendees at each regional worship center has been restored while the number of attendees at the CWMC has increased. This result was possible because of your effort and dedication. 4) Lord’s Day worship service time will be changed starting from 2015. The first Lord’s Day worship service will be held at 7am at Singil Sanctuary (This is when all volunteers for the Lord’s Day gather to worship.). The second Lord’s Day worship service will be eliminated but instead, we will all gather in the CWMC at 11am. We used to not have the second but only have the first and third worship services at the CWMC for on special occasions. Likewise, from now on, for those who attended the second service, please come to the CWMC by 11am. Additionally, the first worship service will be on air through satellite. Such change will continue from the first Lord’s Day worship service of 2015. We ask you to please keep this in mind and cooperate with us. Thank you.